Our clients entrust us with keeping their belongings safe, secure, and climate controlled. It is a responsibility that we don’t take lightly. In fact, we created our facility from the ground up for high security. We had a great foundation to start from (literally). Our historic Pittsburgh storage building was designed over 100 years ago for secure storage. The builders lacked modern high tech security systems, so they over-designed the building to give turn-of-the-century tenants piece of mind. Our building has limited access points, interior space dividers, and exterior walls that are three rows of brick think. Built solid, built right. When we started designing our storage facility to go within this fortress of a building, we put our primary emphasis on deterrence – make potential thieves realize targeting us is a waste of time. Many decisions about our layout and storage lockers were made with this in mind. For example, some storage facilities allow you to bring your own lock. The problem with that is most people bring a standard lock with an exposed shackle. Have you ever watched Storage Wars? I’m always amazed at how quickly they cut through those locks. Just a few seconds with a metal disc cutter on a circular saw and you’re in. The embedded slides and video below will show you what we mean. Last year my storage facility was broken into. Had a number of things stolen. I thought my Brinks hardened security lock was a deterrent. It has a 3/8″ shackle, the largest size that will fit the hasp on the roll up door. We evaluated a number of options for our middle security layer. The two most common approaches are surveillance cameras and individual unit door alarms. When individual door alarms are installed, operators usually have surveillance cameras only at entrances, not in the storage locker areas. 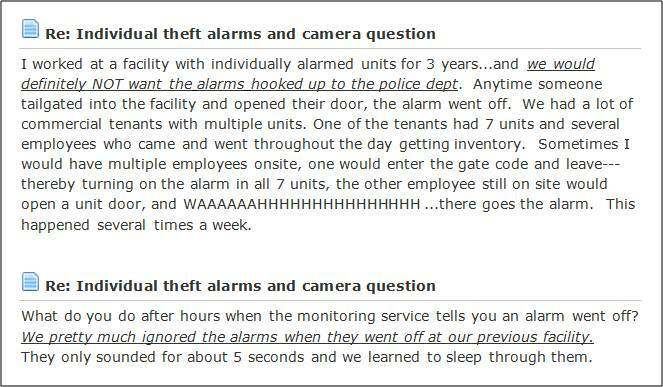 We considered individual alarm systems, but decided against them after careful research. They are a good defense in theory, but not in practice, due to the high rate of false alarms as noted in self-storage owner discussion groups. Individual unit alarms are tied to the facility access control system. Once a person punches in their access code on an exterior door, the alarm on their unit, and only their unit, is turned off. One of the many causes of false alarms is someone who “piggy backs” on another tenant to get into the facility by walking in right behind them. Since they never enter their access code, their alarm goes off when they open their locker door. Because of the high incidence of false alarms and the municipal penalties that go along with them, few operators connect their alarm systems to the police department. This means that no one besides the self storage staff hears the alarm. Like the boy that cried “wolf,” false alarm fatigue sets in among the staff, diminishing the effectiveness and decreasing the deterrent value. We decided that a video surveillance system deployed throughout our storage areas would provide better security and deterrent value for our clients. It’s amazing how much the technology behind these systems has advanced. Not long ago, surveillance systems were analog and produced grainy pictures recorded on VHS tapes that had to be constantly changed (and often weren’t). Today most units have high resolution color cameras, digital video recorder (DVR) units with large hard drives for continual recording, and motion sensors to eliminate recording no-activity time. The monitor sitting in our office with tiled images of the feeds from each camera sends a powerful “don’t bother, we’ll capture your every move” message to would-be thieves. We thought carefully too about our outer layer of security, both to protect break-ins and ensure the personal security of our tenants. Our large garage doors on can only be opened by entering a valid code into our keypads (and of course, we have surveillance cameras on the inside and outside of this area). The area around our outer doors is well lit and patrolled frequently by River Walk Corporate Centre’s security guards. We also have a keypad access point on the other side of our building along Terminal Way, a well-lit and well trafficked area, only a few feet away from the security guard station. There is ample parking here in off-hours, providing our clients an easy and secure way to access units during off hours. Don’t allow anyone to “piggy-back,” by trailing behind you without entering their own access code. While holding a door feels like a courtesy, it’s actually putting you and your fellow tenants at risk. They’ll understand and appreciate the reason when you close the door behind you. Keep your locker locked. Sounds simple and it is. But a surprising number of people leave their door open, ajar, or just unlocked for any number of reasons. Please help keep honest people honest by locking up. Keep your belongings in your unit. People often leave their belongings outside their unit while moving in and out. Your inviting problems by doing this. Park close to the building. When you’re moving in and out, the belongings in your vehicle are exposed. We keep the area right in front of our loading bays clear for people actively loading and unloading. Exterior surveillance cameras in this area provide a deterrent, but please don’t leave any items unattended. See something. Say something. Just like when traveling by air, security is everyone’s responsibility. If you see something that makes you wary or uncomfortable, seek out one of our staff members or one of the River Walk Corporate Centre security guards. Effective security and strong deterrence are key parts of providing you with the best Pittsburgh storage experience!